The EF 85mm f/1.8 USM is a consumer level lens. 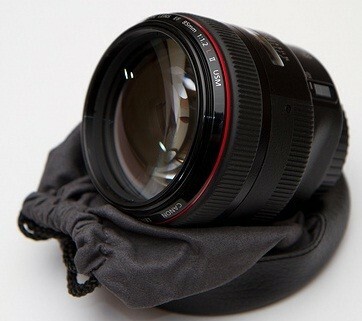 It is the shorter sister to the EF 100mm f/2.0 USM, and is designed very similarly. It is constructed with a plastic body and a metal mount. This lens features a distance window with infrared index. An 8 blade, maximum aperture of f/1.8, gives this lens the ability to create depth of field effects. The optical construction of this lens contains 9 lens elements, without any special lens elements. It uses an internal focusing system (meaning that the front of the lens neither rotates nor extends when focusing), powered by a ring type USM motor. Auto focus speed of this lens is very fast. The newer EF 85mm f/1.2L II USM version, which is aesthetically the same as the EF 85 mm f/1.2L USM, is updated with a newer CPU, 1.8 times faster autofocus, and upgraded anti-reflective lens coatings to reduce chromatic aberration, ghosting, and lens flare.